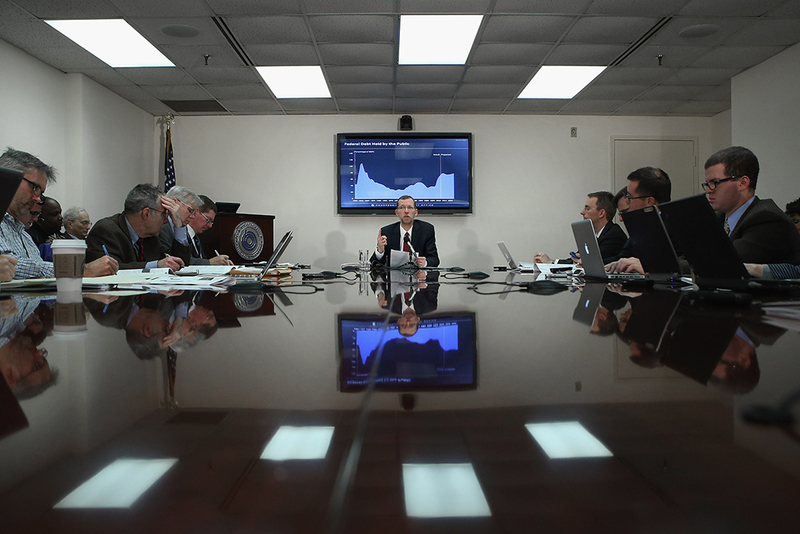 At a table surrounded by reporters, then-Congressional Budget Office Director Douglas Elmendorf holds a news conference for the release of the annual "Budget and Economic Outlook" report, at the Ford House Office Building, February 5, 2013, in Washington, D.C. In reforming the congressional budget process, Congress should strengthen nonpartisan institutions such as the CBO, put taxes and spending on a level playing field, and eliminate brinkmanship over the debt ceiling. Tax legislation enacted by the 115th Congress, commonly referred to as the Tax Cuts and Jobs Act (TCJA) of 2017, exposed significant problems in Congress’ deliberative mechanisms. The far-reaching tax changes were rushed through Congress in a matter of weeks under the special fast-track budget reconciliation process, straining procedures that had been designed to ensure deliberative and inclusive consideration of fiscal policy. The process itself was also rushed and closed: Congress held no hearings on the legislation where it could have heard from tax experts, affected communities, or the general public; it conducted key negotiations behind closed doors; and it made numerous, consequential changes at the last minute before critical votes, without providing sufficient time for the public or even most members to understand the effects of those changes.2 It is essential to restore rationality and basic norms to the budget process in order to ensure that this approach does not set a new and dangerous precedent for the nation. The current budget process was established by the landmark Congressional Budget and Impoundment Control Act of 1974, also called the Congressional Budget Act (CBA). Understanding the successes and failures of the CBA can inform a way forward toward achieving a more effective budget process. The CBA established new institutions in Congress, including the CBO and the Budget Committees in the House and Senate. It dramatically curtailed the power of the president to withhold federal funds once Congress has appropriated them. It improved the availability of information to inform decision-making and established an annual process for developing and approving the federal budget. The results of the 1974 CBA have been mixed, however, in terms of both its stated goals and the budget process that evolved. In hindsight, it succeeded most where it improved the information and analytical capacity available to Congress and enhanced congressional authority over the budget. It has been less successful in ensuring that Congress enacts timely budgets. While the budget process at first worked largely as intended, adherence in Congress to the CBA’s processes and deadlines has eroded, and today, the budget process has been warped by brinkmanship and partisan posturing, as members of Congress increasingly use budget chokepoints to try to extract policy concessions from the other side. This report examines the major reforms enacted as part of the CBA and assesses what is working and where the current budget process has gone astray.3 The report recommends several reforms, including that Congress should increase transparency and access to information by strengthening nonpartisan institutions such as the CBO and creating neutrality between tax and budget processes. It also recommends that Congress take steps to address the brinkmanship and partisan posturing in the current budget process by eliminating the debt ceiling and streamlining the budget resolution process. Impoundment is the refusal by the president to spend funds that have been appropriated by Congress. These concrete measures will not solve all the woes of the current budget process, but they will help halt the erosion of the norms and processes that support an informed and coherent fiscal policy, as well as help put in place an improved framework for policymaking that allows for more effective management of the federal budget. The Congressional Budget Act achieved four main reforms to the federal budget process. It established the Congressional Budget Office and the House and Senate Budget Committees, it ended the practice of impoundments, and it established an annual process for developing and approving the federal budget. Each is detailed in the following sections. A budget score is an estimate of how particular legislation proposed in Congress will affect government spending and/or revenue. In general, the Joint Committee on Taxation scores revenue bills, while the Congressional Budget Office scores all other bills. While policymakers and outside critics have challenged the CBO’s assumptions and methods, as well as the accuracy of its projections, in specific instances,14 the CBO has maintained strong bipartisan support and a reputation for integrity, even-handedness, professionalism, and commitment to empiricism. The nonpartisan staff members of the Joint Committee on Taxation, which dates back to 1926, play a similar role for revenue legislation and are similarly highly regarded. The third major accomplishment of the CBA was the elimination of impoundments. As early as Thomas Jefferson,15 presidents had asserted this privilege of withholding funds from congressionally appropriated programs. This power was rolled back by the CBA in an effort to re-establish the congressional power of the purse and return budget authority to Congress.16 The CBA required the president to seek congressional approval in canceling appropriated funds, through a process known as rescission. Under the act, if the president wishes to deny funds for congressionally approved activities, he may request that Congress rescind the funds. However, if Congress does not approve this request or fails to take any action within 45 days, these funds are required to be released.17 The elimination of impoundments successfully shifted an important budget authority from the executive branch to the legislative branch. In addition to establishing new institutions and authorities within Congress, the CBA also put in place major reforms to the process and timeline for establishing the federal budget.18 These included setting up processes for budget resolutions, budget reconciliation, and establishing new timetables for Congress to conduct its work. Under the CBA, the budget resolution may contain reconciliation directives for certain committees, providing numerical targets on increasing or decreasing outlays, revenues, or public debt. The reconciliation process was originally designed to ease the politically difficult process of deficit reduction; bills considered under the reconciliation process enjoy fast-track procedures—including, most importantly, that they cannot be filibustered in the Senate, and can therefore be passed with a simple majority. Budget reconciliation refers to the special procedures that the Congressional Budget Act created for certain budget-related bills. When congressional leaders want to use reconciliation to facilitate the passage of a bill, they must include reconciliation directives, also known as instructions, in the budget resolution. The directives charge committees with drafting legislation meeting certain budgetary targets. Crucially, reconciliation bills cannot be filibustered in the Senate, so they can pass with a majority of votes rather than three-fifths. However, the Senate’s Byrd Rule constrains the content of reconciliation bills. For example, provisions that are not sufficiently budget-related, provisions that amend Social Security, and provisions of bills that increase deficits outside of the budget window—unless part of a budget-neutral title of the bill—can be struck out of a reconciliation bill unless there is a three-fifths majority to retain them. As a result, in the context of today’s divided government, where the filibuster has been used routinely, the fast-track process of reconciliation is increasingly used to make major policy changes.27 In order to prevent members of Congress from fast-tracking provisions that are unrelated to the reconciliation goals, the Senate adopted the Byrd Rule in 1985, and in 1990 incorporated it into the CBA, thus making it permanent.28 The Byrd Rule allows any senator to raise a point of order to strike provisions that add to the deficit after the budget window—unless those budget effects are offset by other provisions within the same title of the legislation or are otherwise extraneous. Waiving such a point of order requires the vote of three-fifths of the Senate; otherwise, the provision is struck from the underlying legislation. [W]e are in the process now of seeing … the Pandora’s box which has been opened to the abuse of the reconciliation process. That process was never meant to be used as it is being used. There are 122 items in the reconciliation bill that are extraneous. Henceforth, if the majority on a committee should wish to include in reconciliation recommendations to the Budget Committee any measure, no matter how controversial, it can be brought to the Senate under an ironclad built-in time agreement that limits debate, plus time on amendments and motions, to no more than 20 hours. The budget resolution includes 302(a) allocations—named for the section of the Congressional Budget Act that created them—which apportion the topline level of spending in the budget resolution among the congressional committees. The appropriations committees then divide their allocations into 302(b) suballocations among the 12 subcommittees that draft the 12 appropriations bills. The legislative history of the Congressional Budget Act demonstrates congressional concern over impasses and a failure to reach consensus.38 While many of the process improvements established by the CBA have not resolved these issues, several clear lessons can be distilled from the CBA. New institutions, such as the Congressional Budget Office and the Budget Committees, established by the CBA have given Congress greater insight into the consequences of its policies. In the 1970s, congressional committees frequently reported out seemingly technical changes to benefits formulas or other economic drivers of legislation. However, as these policies were implemented, these modified formulas could result in hundreds of millions of dollars in increased cuts or spending that were outside the visibility or control of the president, key committees, or other policymakers.39 Without the necessary information or feedback loops required to make responsible choices, Congress inadvertently locked in spending changes without making a specific policy choice to do so. By establishing the CBO, Congress is now more able to adequately assess the impacts of its decisions. The public too is now supplied information on the economic impacts of proposed legislation, better allowing congressional representatives to be held accountable for their votes. The CBA has provided necessary elements of more thoughtful, informed, and transparent debates across the federal government. To the extent that the nation’s current discourse and debates in Congress fail these standards, that is in spite of and not because of the CBA’s reforms. The fiscal year 2018 budget resolution passed by the House of Representatives provides a vivid example of these budget gimmicks. This bill relies on several unrealistic assumptions, including rosy growth estimates, vague and unrealistic cuts to discretionary spending, and unrealistic policy assumptions. The bill assumes an average real gross domestic product growth rate of 2.6 percent for the decade, well out of the range of mainstream estimates, including that of the CBO. It contained savings of $620 billion in unspecified cuts to spending, and $700 billion on top of that through cutting improper payments without providing policy guidance on how it would do so.41 The House budget also did not account for the cost of the major deficit-increasing tax overhaul that congressional leaders were crafting at the time, and which they ultimately enacted in December 2017.42 While process changes cannot force leadership decisions, it is important to generate a process that establishes strong norms and increases transparency. Continuing resolutions are temporary measures to keep the government funded. They are required when Congress and the president have failed to enact regular appropriations bills before the beginning of the fiscal year on October 1. They generally continue funding for agencies at roughly the previous year’s levels. The debt ceiling is an overall limit on the amount of money that the U.S. government can borrow to meet its ongoing obligations. These obligations include paying Social Security and other benefits, salaries for civilian government workers and the military, and interest on outstanding debt. When the government reaches the debt ceiling, the Treasury Department can no longer sell bonds to raise cash. And if the cash runs out, the government would default on its obligations. A key point about the debt ceiling is that raising the debt ceiling only enables the Treasury to issue debt instruments to meet existing obligations. In other words, raising the debt ceiling does not affect Congress’ power to enact spending increases or tax cuts that increase the debt; it merely allows the Treasury to make good on the obligations the government already has—for example, to pay Social Security benefits. Moving forward, there are a number of issues that Congress should focus on in order to craft a more efficient, accountable, and transparent budget process. Recently, nonpartisan analysts have been increasingly under fire from members of Congress and outside partisans who disagree with analyses that do not bear out their claims. Now more than ever, these nonpartisan institutions are critically important both to ensuring that the legislative and executive branches are operating on equal footing and to creating a transparent budget process in which Congress and the public have access to vital information in a timely manner. To allow for the CBO and the JCT to continue filling this key role, Congress should make sure that these institutions—in addition to Congress’ other nonpartisan institutions—are adequately funded and have sufficient time to fully examine the impacts of a bill before it is signed into law, including, where appropriate, the policy impacts of the proposal. Moreover, Congress should work to provide at least a 72-hour window—with exceptions only for emergency legislation—between the presentation of a score and voting on legislation, allowing Congress and interested parties time to analyze and comment on its effects. This past year, the CBO’s staff provided analysis on a sweeping range of topics including immigration, water rights, health care, and taxes. They produced 740 formal cost estimates, the highest number in a decade, yet still fell short of completing all requests. To accommodate its increasingly important role, the CBO has requested additional funding to hire an 20 additional staff members by 2021.49 Expanding the institution will be critical to meeting the ever-growing needs of congressional appropriators. Thorough nonpartisan analysis is invaluable and essential to the budget crafting process, so Congress must ensure that these agencies have the support they need to achieve their mission. A tax expenditure is the revenue that the government loses due to special provisions of the tax code such as exclusions, exemptions, deductions, deferrals of tax liability, or tax credits. The Joint Committee on Taxation and the Treasury Department publish lists of tax expenditures each year, along with their estimated budget cost. Tax expenditures are economically equivalent to spending. For example, if a company meets certain criteria to qualify for a $1,000 tax break, it is $1,000 better off and the U.S. Treasury is $1,000 worse off; the result is the same as if the government directly provides a $1,000 subsidy to companies meeting the same criteria. Examples of major tax expenditures include the research (R&D) tax credit, the mortgage interest deduction, the special lower rate on capital gains and dividends, and the Earned Income Tax Credit. Mandatory spending, also known as direct spending, refers to spending that Congress has authorized outside of annual appropriations bills. Most mandatory spending is through benefit programs such as Social Security and Medicare. In contrast to discretionary spending, the overall amount of spending through mandatory programs is determined indirectly by rules that Congress sets for eligibility, benefits, and other payments—not by fixing an annual amount to be spent on each program. Discretionary spending is spending that Congress determines each year to fund federal agencies and programs. Congress enacts 12 appropriations bills each year to fund federal agencies—though it frequently combines all or some of the 12 appropriations bills in an “omnibus” or a “minibus” bill. Appropriations bills fund national defense; law enforcement; science; transportation; and many health, education, and veterans’ programs, among many other government functions. Harris and co-authors identify several promising avenues for systematic oversight and evaluation of tax expenditures. These include regular evaluation within the executive branch, where the Treasury’s Office of Tax Policy—if given additional resources—would be best situated to study the effectiveness of tax expenditures, in coordination with the OMB and the relevant agencies. Congress’ Government Accountability Office evaluates government programs, sometimes including tax expenditures; with additional resources, it can be tasked with more systematic review of tax expenditures. In addition to implementing stronger, more frequent oversight and evaluation of tax expenditures, policymakers should ensure that revenue and spending are put on a level plane in the budget process—including when it comes to any budget enforcement mechanisms such as triggers or sequesters that go into effect automatically when certain fiscal targets are missed. The budget process should be neutral with regard to spending and revenue, and policymakers should be wary of proposals that are slanted in one direction. Sen. Rob Portman (R-OH) introduced one such piece of slanted legislation in 2013, the End Government Shutdowns Act,55 which would have created a process for an automatic CR if the government failed to pass any appropriations or temporary CR bills before the start of the fiscal year. If enacted, the automatic CR would have caused increasingly large cuts to government programs and enactment of fewer appropriations bills. After the fourth year of failed appropriations, overall funding would be 10 percent lower than at the start of the first year, eventually increasing to 26 percent after 10 years.56 Even if an automatic CR held appropriations levels constant in nominal terms from one year to the next, it would amount to an effective cut in the real value of government services. An automatic CR would be a one-sided cudgel, since tax expenditures and taxes in general would be unaffected. That imbalance would make it more likely that conservatives who want to slash government services would accept the automatic CR or even embrace it. In so doing, the proposal could make it even more difficult for Congress to reach agreement on annual appropriations bills that sensibly address national needs and priorities. The debt ceiling is an antiquated law that could one day trigger a U.S. government default if it continues to be abused, with large, negative repercussions for global financial markets and the U.S. economy. Congress should put an end to the unnecessary uncertainty that comes with raising the debt limit, and instead eliminate the measure altogether. The moment for Congress to make decisions about spending and revenue is when it makes decisions about spending and revenue, not when the bill comes due. The timeline for congressional budgeting has almost entirely broken down in recent years. Congress routinely misses appropriations deadlines, setting back agencies in determining their own budgets. It is time to hit reset and establish a more streamlined, front-loaded process. In February, the Convergence Building a Better Budget Process Project—a collaboration of budget experts, advocates, and executives from across the political spectrum—developed a practical proposal for a two-year “Budget Action Plan” that would be negotiated between Congress and the president at the beginning of each Congress. The Budget Action Plan would be considered under rules similar to those that now govern the budget resolutions and reconciliation—that is, debate would be limited, and it would not be subject to Senate filibuster.60 The plan would serve the basic function of setting topline budget authority levels for each of the two fiscal years of the congressional term. (The Convergence Project also recommends that the Budget Action Plan include increases in the debt limit. As discussed above, CAP believes the debt limit should be eliminated outright.) Appropriations bills would still be developed on an annual basis under current congressional procedures. Two-year budgeting would essentially formalize the habit that Congress has already fallen into in recent years of striking two-year deals on topline budget levels. But formalizing the process and moving it up to the beginning of each Congress would force Congress to make decisions earlier, giving more time for the appropriations process. That, in turn, would make it more likely for Congress to pass appropriations bills on time, allowing agencies to plan appropriately. Together, these changes will not guarantee that Congress makes better budget choices—but they would make the budget process more rational, less cumbersome, and potentially less partisan. The Congressional Budget Act grew out of frustration with a broken budget process. It succeeded in reasserting Congress’ prerogative over the federal budget, and it created vitally important institutions for improving the information used in budget decisions. However, while some of the reforms to the budget process looked good on paper, in practice they have been less successful in creating a more transparent, effective, and accountable process for guiding the nation’s budget priorities. The failure of these process improvements indicates that process alone cannot address all of the problems plaguing congressional budgeting—some of the issues stem from the erosion of shared norms, resulting in less respect for disinterested expertise, an increase in partisan brinkmanship, and the breakdown of what used to be a shared commitment to improving how government functions. Still, concrete reforms can make a real difference in the budgeting process. Increasing access to nonpartisan information, eliminating opportunities for brinkmanship and partisan posturing, and increasing transparency and accountability can ensure a process that is more informed, coherent, and effective. Sam Berger is the senior adviser at the Center for American Progress. His areas of expertise include health care policy, government reform, regulatory policy, appropriations, and administrative law. From 2015 to 2017, Berger served as a senior policy adviser at the White House Domestic Policy Council, where his work focused on the Affordable Care Act and Medicaid. From 2010 to 2015, Berger worked at the Office of Management and Budget in various roles, including senior counselor and policy adviser. Seth Hanlon is a senior fellow at the Center, who focuses on federal tax and budget policy. From 2015 to 2017, Hanlon served as special assistant to the president at the White House National Economic Council. Previously, he served as senior tax counsel on the House Budget Committee Democratic staff, in addition to other staff positions on Capitol Hill. Galen Hendricks is a special assistant on the Economic Policy team at the Center. The authors would like to thank Pablo Alvarez, a former intern with the Economic Policy team at the Center, for his research assistance.